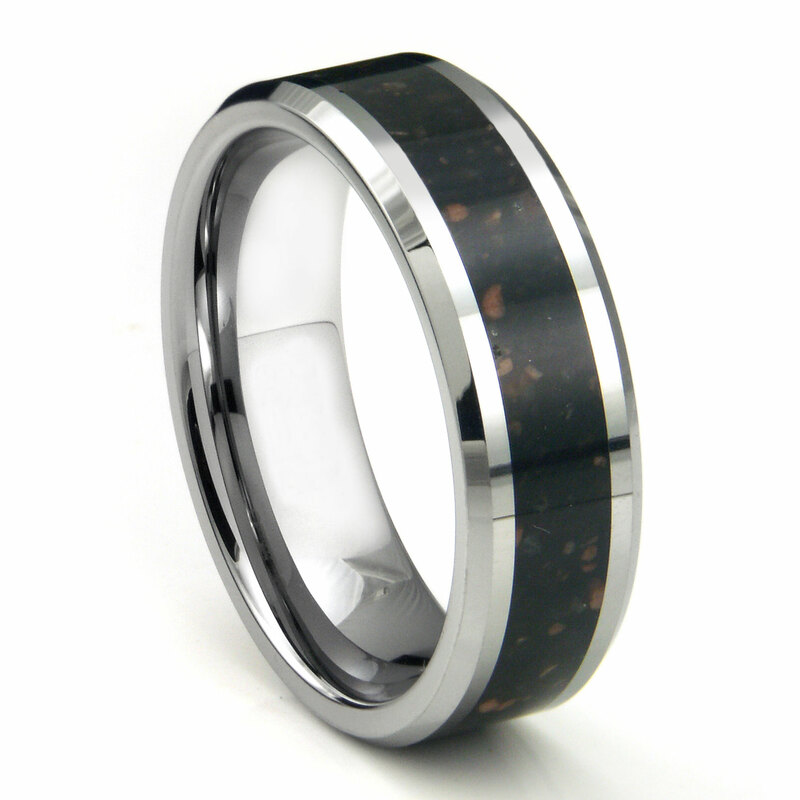 Our tungsten black lava riverstone inlay wedding band which is a very unique and different men's wedding band. Created in 8mm wide high polish tungsten with black lava riverstone inlayed along the surface of the ring. Making the ring so unique is the lava riverstone inlay which will never be exactly the same between any two rings due to the individual characteristics of each stone. We think these unique rings are as individual as the person who gets to wear it daily. Backed by our 100% lifetime warranty the tungsten black lava riverstone inlay wedding band is made to last forever. Made of the strongest metal known tungsten is able to withstand the rigors of everyday life. The ring is perfect for those in the construction trades for example as it will not scratch, bend, misshape, warp, or fall out of round. The ring will last a lifetime and more. You are welcome to shop our entire line of titanium and tungsten jewelry. Ordered this for my wedding ring. Sturdy construction and nice design. This is a beautiful ring. I am so thrilled to wear it. It is just gorgeous - nice work!